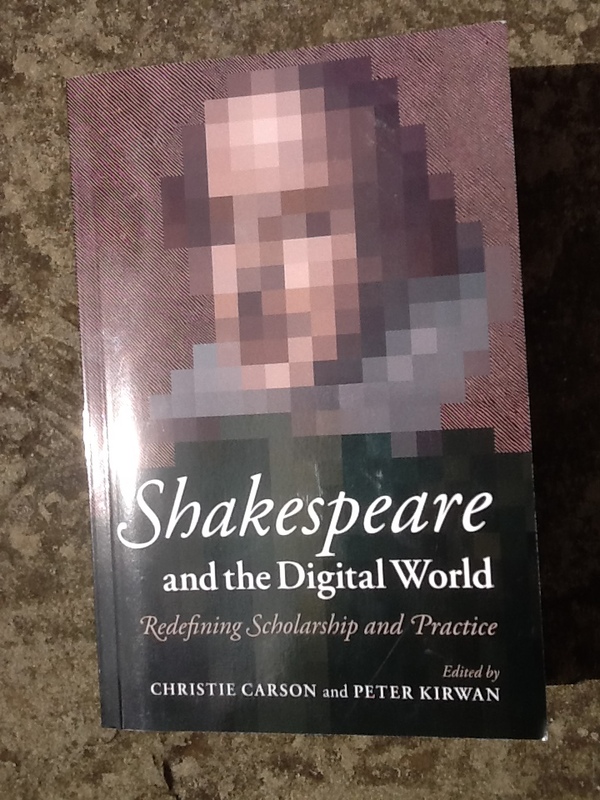 In my last post I spent some time reflecting on the introduction to Shakespeare and the Digital World by way of the Year of Shakespeare project; in this post I want to dive right into part one of Carson and Kirwan’s edited collection, which focuses on RESEARCH. Each section in the book is fronted by a short introduction by one of the editors, and here Carson begins with a quotation from Katherine Rowe: ‘Older forms and values provide a vital intellectual framework for the way we use newer media, shaping the needs we bring to the new tools and the opportunities we find in them’ (qtd p. 10). It’s an apt start to a section that often focuses on the experience of the researcher, and especially on the experience of researchers for whom the world hasn’t always been digital. Essays from John Lavagnino, Bruce Smith, Farah Karim-Cooper, and David McInnis make up this thought-provoking opening section, and below are four big ideas I am left with after reading it. (1) Digital research is more than what we think it is. John Lavagnino starts us off with a snapshot of the long history of digital, electronic, and computer-assisted humanities research. Digital humanities may have come on the scene in or around 2008/9, he reminds us, but ‘”applied computing in the humanities” has been visible since the 1940s’ (p. 14). In addition to looking back, Lavagnino’s chapter also looks around and forward at digital research now, in particular its use of tools and resources created by industry rather than the academy (Google Books, YouTube, etc. ), and the fact that even people who wouldn’t consider themselves digital humanities scholars are doing ‘invisibly digital research’ through their use of EEBO, Literature Online, and the like (p. 22). Bruce Smith’s subsequent chapter discusses what it feels like when that naturalized kind of digital research is made visible, primarily through its disruption. Here he reflects on the experience of locating a book in the library that eludes him online, which prompts him to consider how much and how quickly we have come to take for granted widespread access to research materials that were previously the focus of more limited, time-bound, and difficult scholarly pilgrimages. (2) Digital research is more mediated than non-digital research– or is it? Karim-Cooper’s chapter on iPad technology continues with a meditation on the experience of the researcher today, one who is ‘no longer able to sit for hours researching and writing in university libraries, but … [is] instead encouraged to run multiple projects simultaneously, create new partnerships and travel around speaking to the public, all while maintaining an impressive publishing profile’ (p. 37). Tools like the iPad help facilitate research in unlikely but necessary places — namely, on trains — but for Karim-Cooper they ultimately remain just that: tools. While research into haptic technologies is working on putting the sensation of touch back into the touchpad, Karim-Cooper observes how researchers ‘of the screen’ miss out on the full sensory experience of handling, and thus learning from, material books. Does this mediation of physical feeling, she wonders, also entail a parallel mediation of emotional and cognitive affect? When we use an iPad or any other screened device to read literature, ‘Will we be able to feel the effects of poetry in the same way?’ (p. 38). Smith likewise considers the embodied experience of the researcher, and the way in which digital research methods are reshaping what he calls ‘the phenomenology of knowledge’ (p. 29). For him, though, digital research is radically unmediated, in that pages from digital facsimiles appear to us online without context, without ‘sedimentation’, without history. They are simply there, and their dissociation from anything else leads Smith to suggest that digital research is a supremely ‘presentist’ way of working. What you see is what you get, but perhaps not much more. (3) Digital research has often been about tools and resources, but maybe it needs to start being more about research questions. Lavagnino’s opening essay suggests that the most influential digital scholarship has taken the shape of scholarly resources rather that critical or analytical innovations, and Smith and Karim-Cooper’s interest in the digital primarily as tool or approach adds to this line of thought. But David McInnis’s final chapter presents an example of how digital ways of working may also allow us to change the fundamental research questions we can ask. Although he explains that he and his colleagues did not initially think of the Lost Plays Database as an online project, they eventually realized they needed to go digital in order to allow for the international scholarly collaboration that was needed to meet the aims of their project: ‘Creating a record of this disparate and obscure information [i.e. that involved in tracing lost plays] relies on collective knowledge and the assemblage of information which has little significance on its own … encouraging new and easy ways of interacting with other scholars is essential if the sum is to be greater than its parts’ (pp. 45, 52). While we might often think of digital work as isolating, distancing, or even antisocial, McInnis shows that this certainly need not be the case. What’s more, his bibliography of the collaborative print publications that have emerged from the LPD project likewise illustrates that the divide between ‘traditional’ and digital ways of working may not always be as stark as we first think. (4) Digital research is not necessarily easier, cheaper, more democratic, more manageable, more innovative, or faster than non-digital research. Lavagnino starts the section with the warning that ‘a common problem has been unrealistic ambition or overestimation of what can be done in a purely computational way’ (p. 17), and McInnis finishes it with the observation that ‘the transition from print to web is often made with little planning or critical reflection’ (p. 43). That has certainly been my own experience in terms of digital projects. What’s the point of doing things digitally, if you don’t have a strong sense of how or why you’re doing them in the first place? Which is something I’ll no doubt come back to in my post on part 2 ofShakespeare and the Digital World, which focuses on teaching and pedagogy in the digital age.